In 2014 the Guild of Students decided to improve recycling performance through the separation of food waste. Working closely with Hospitality staff from the University, two waste management strategies were introduced. The first was collection of contaminated food waste for anaerobic digestion by ‘Refood’. 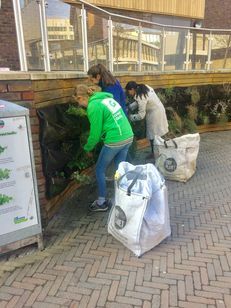 By January 2015 a ‘Rocket’ composter and de-watering plant had been installed which was fed with processed uncontaminated food waste from the kitchens. This is converted into nutrient rich compost in just two weeks after which is then used on the Guild’s growing areas. Run by student volunteers these include a Guild roof garden, two vertical gardens and a permaculture site. Over the last three years over 28 tonnes of food waste have either been converted into fuel gas and farm fertiliser or used on-site producing compost. Surplus compost is distributed to local community allotments and schools. The process attracts wide interest both at home and internationally! We now realise that the management of food waste should attract the same level of attention as does cultivation, procurement, preparation, presentation and sales with caterers taking ownership of the waste issue. Engaging and training all stakeholders and working collaboratively to keep everyone informed from the start has been essential for us to embed the new procedures so they are now routine. Composting is achievable in a busy city centre location and complements our growth in urban farming. CO2t savings over the life cycle of the project: 11.17 over 3 years to date.